Auditorium-style classrooms and large conference rooms. The ZU510T-W is designed for the presentation of eye-catching business graphics, text docs and spreadsheets, and HD 1080p video in well-lit venues like classrooms and boardrooms. Displays and signage. Four corner correction, Portrait mode, 360 degree pitch installations and dust-resistance 24/7 operation make the ZU510T-W a compelling choice for signage and for displays in museums and the like. IP5X-certified dust resistance for maintenance-free operation. Can mount in portrait mode and at any pitch over 360 degrees. Pair of on-board 10-watt speakers with robust sound quality. Quiet, at only 28 dB in Eco mode. Physical attributes. All ports but two are on the back panel, taking up the left two thirds of the top half of panel as viewed from behind with the projector resting on a table. The power connector is just below the ports, on the left side, with the Kensington lock slot just to its right. The remaining two ports--an HDMI/MHL port meant for a wireless dongle and a USB A port for power--are hidden behind a push-to-release door to the right of the lens, as viewed from the front, along with the thumbwheels for setting the vertical and horizontal lens shift. The intake vents cover almost all of the right side as viewed from behind. The exhaust vents cover the entire left side. Controls are on the top, near the back, and centered between the left and right sides. The security bar is on the bottom, near the right side as viewed from behind, set back about a third of the way from the front. Low Lamp Mode. Eco mode is about 69% as bright as Normal lamp mode and still easily bright enough for many large rooms. Presentation Optimized Lumens. The ZU510T-W delivers vibrant color even in its brightest mode and without the obvious green bias that's common for many projectors brightest modes. That's enough to make Bright mode with default settings the Presentation Optimized mode as well, at the projector's top brightness of 5005 lumens. Video Optimized Lumens. For video, Movie mode with its default settings delivers the best balance of saturated color and good contrast ratio, at a touch over 3100 lumens. Zoom Lens Effect on Brightness. The 1.8x zoom lens curtails light by about 36%, dropping Bright mode from 5005 lumens at the widest angle setting to 3209 lumens at maximum telephoto. Brightness Uniformity. The 74% brightness uniformity is low enough for a hot spot to show at the bottom center of a solid white image, but it's not enough to notice with any text, graphics, of photo that that breaks up the field of view. Input Lag. The input lag in all preset modes was 82 ms.
On-board Audio. The paired 10-watt stereo speakers deliver more than acceptable sound quality and easily enough volume to fill a mid-size room. Fan Noise. The ZU510T-W's level of fan noise is typical for its size and brightness, at a rated 33 dB for Normal mode and a much quieter 28 dB for Eco mode. Noise in high altitude mode is also typical. Optoma recommends using it at 2500 feet and above. Throw distance. The 1.8x zoom lens throws a 150" diagonal 16:10 image from between 12.5 and 22.5 feet. Check the Projection Calculator for the throw distance needed for the image size you want. Offset and lens Shift. The vertical lens offset and lens shift is designed to work well with the projector on a table or cart, or upside down in a ceiling mount. At the native 16:10 aspect ratio, with the projector sitting on a table, the entire image is above the centerline of the lens, with the bottom of the image roughly 4% to 22% of the image height above the lens centerline, depending on the vertical shift setting. The horizontal shift range varies from about 1% to 8% of the image width to either side of neutral position depending on the vertical shift setting. If you need to tilt or swivel the unit to move the image father than the lens shift can accommodate, you can adjust both horizontal and vertical keystone by up to +/- 30 degrees or take advantage of the ability to adjust individual corners. At $5,299, calling the Optoma ZU510T-W aggressively priced is an understatement. 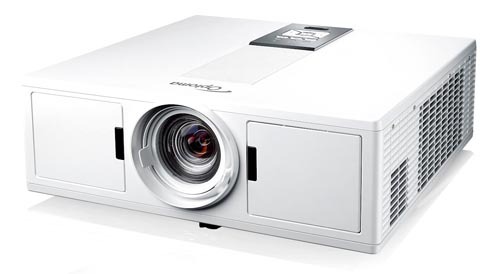 It is by far the least expensive 1920x1200 laser-phosphor projector in its performance class. It is also the lightest, at 24.2 pounds, which makes it easy to install. And its 5000+ Presentation Optimized lumens is bright enough for up to a 200" 16:10 diagonal image with a 1.0 gain screen in moderate ambient light. Even its Video Optimized setting, at 3100 lumens, will let you watch a full length 1080p movie with some lights on at 155". In addition to its light weight, the projector's 1.8x zoom lens with H+V lens shift adds flexibility for setting up in a classroom or conference room. The option to both control the projector and send data over a network can also be more than a little helpful. For more challenging installations--displays and signage for example--the ZU510T-W's 24/7, maintenance-free operation and its 30,000-hour lifetime can be even more important, if not critical. So can its more advanced setup features, including stacking of two projectors to double brightness, portrait mode, and mounting at any pitch over 360 degrees. Adding to the ZU510T-W's luster is the 20,000 hours/5-year warranty on the light engine and 3 years on the projector itself, with express shipping of a replacement unit. This is among the best warranties in the projector industry. It pretty much seals the deal on making the Optoma ZU510T-W a solid value and an excellent choice for a variety of signage, display, classroom, and conference room installations.